As the price of energy continues to rise and we continue to experience changes in our climate, the problem has never been so obvious: The world is in dire need of a cheap, clean way to acquire energy. Day after day we’ve all heard that we need to be more responsible with the world which is our home, and day after day our shrinking wallets push us more quickly to action. But we don’t need to waste your time telling you what you already know, so let’s skip to the important issue: What is the best way to solve this problem? To cut straight to the point, solar energy is the answer IF a truly affordable method of harnessing the sun’s energy can be produced, here’s why. It’s gonna be a bright sun shiny day! The most consistent, reliable source of energy that our planet has is the sun. And lucky for us, it doesn’t turn off if we’re late paying the bills. It’s always there and it’s always free. But that doesn’t mean anything if you can’t make those warm rays turn the lights on at night, keep your food fresh, or warm your home when it’s cold outside. The world has taken steps in the right direction; the photovoltaic panels that are on the market are nice, but the extreme cost has kept them from becoming widely implemented. Even with the recent government incentives the cost has still been out of reach for the average private consumer or business. Large-scale thermal solar plants do a fine job but they are generally built far away from where we live, making maintenance of these plants a challenge. There’s just something wrong with the fact that it’s so difficult to utilize what is otherwise free and abundant. To be frank, we hate that. We wanted to change the way solar energy is approached. And change it we have! Our project started out small with just 2 “slightly eccentric” inventors: Matt Bellue, an Aerospace CNC Machinist/Programmer with a passion for exploring new inventions and making them real, and Ben Cooper, an engineer and dedicated inventor with extensive background in the sciences. With our experience, passion for inventing, dedication to an affordable clean energy solution, and a healthy dose of outside the box thinking, we knew we could solve this problem. And so we founded our company, Missouri Sustainable Energy. We spent months just researching what other people had already done. What worked and what hadn’t. What showed promise and what flopped. We hemmed and we hawed, we even played “Pin-The-Solution-On-The-Solar-Donkey” (hmmm, hopefully we get a a few courtesy laughs for that one) And after all that, we finally came up with something that nobody had ever thought of or tried. Are you ready to hear about how we’re going to change the world? It all starts with a standard gasoline engine. Yes, that’s right; we’re going to make a gasoline engine generate electricity by running it on solar power. Sound outrageous? Well, it might, but keep reading! The principle in a gas/diesel engine is fairly simple: Inject fuel into the engine, a spark is fired, an explosion occurs and as a result the piston moves, turning a generator, pushing a car, or driving whatever the engine is connected to. Now here’s where we turn the world upside down. Take that same engine and modify the variables slightly; instead of injecting gas/diesel, inject hot oil (using mirrored parabolic solar collectors, temperatures of 800 degrees farenheit can be reached!) into the cylinder. Instead of a spark, add a few microdroplets of water. When the water contacts the hot oil, the oil’s thermal energy is transferred to the water and it instantly flashes to steam. When water changes from a liquid to a gas, it has the potential to increase it’s original volume by 3,000 times. It’s this powerful expansion that drives the engine. 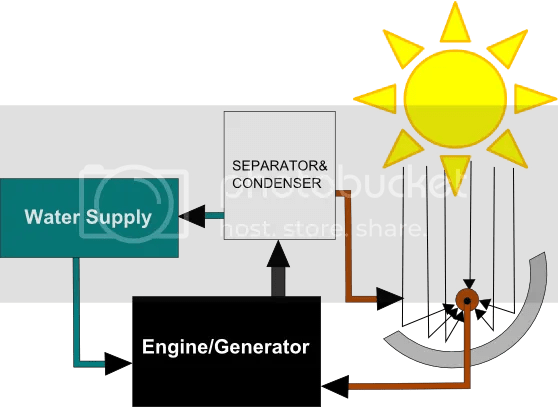 Just connect a generator to the system and there you have it: An engine that only requires the warmth of the sun to produce electricity. For just a quick second, let’s consider something that is often overlooked: Safety. Safety is A MAJOR problem associated with steam turbines and engines. Each of these devices require high-pressure steam that must be created outside of the system in a boiler before being injected into the device. Steam can be extremely deadly at these pressures and the slightest problem or leak could result in fatalities. This is an acceptable hazard when utilized at the utility level by trained professionals, but NOT among homes, business, and communities. Using the HydroICE method, the required steam is generated inside the engine where the work is being done. This eliminates the extreme hazard and makes it safe for use anywhere. So to summarize: A mirrored parabolic solar collector heats the oil, the hot oil is injected into the engine, and then a small burst of water is injected into the engine. When the water contacts the hot oil, it flashes to steam and expands which causes the engine to turn. The engine drives a generator which creates electricity, here’s a diagram of the complete closed-loop system. We’ve had a few people ask to see an example of the oil/water reaction in action. Check out the video gallery at the top of this page for an eye-popping example of what we’re talking about. In all of our countless hours of research, we haven’t found anybody who has mentioned, let alone come close to trying this idea. Why? Who knows, but we finally did and that’s what matters most. USING THIS METHOD, IT’S FEASIBLE THAT WE COULD SEE THE COST OF SOLAR ENERGY DROP BY OVER 75%! Here’s a cost comparison between the average cost to have a PV panel system installed versus a conservative projected installed cost of our new system. For all of you extra-curious types, we also want to mention that the system will include an oil/steam separator because, as we all know, water and oil don’t mix. This technology has been around for a long time and will allow our system to run on a closed-loop, using the oil and water over and over again. That’s it. Not so outrageous after all! For our prototype system we engineered the conversion of a small, 31cc, 2-stroke engine that you would typically find in a weed-eater or other similar equipment. Once we finished the design, Matt machined all of the parts necessary to make the modification. Matt has asked that we don’t brag too much about him but he’s pretty darn good at what he does and in no time at all we had a finished prototype engine that was ready to be tested. Below you will find a diagram from our patent on this new approach. The next step is pretty obvious: Let’s test this thing! We started searching for a place to conduct the tests and presented the project to Dr. Steve Watkins, professor of Electrical Engineering and associate chair of the department at Missouri University of Science and Technology. We told him the story of our research, explained the concept and design we had come up with, and let him inspect the modified engine. Needless to say, he was extremely enthusiastic about the work we had done and with his help, we presented the task of conducting these tests to a number of students for their senior design projects. The idea is moving forward and becoming a bigger reality each day! As it looks now, there will be 4 different senior design project teams working together to test the closed-cycle solar system. Team 1, from Mechanical Engineering at MS&T, will design and create the infrastructure around the engine. This infrastructure will include pumps, piping, heat exchangers and the like. Once this is in place, we will be able to conduct all of our tests. Team 2, from Electrical Engineering at MS&T, will create the control and feedback system to operate and monitor the engine during the testing phase. Team 3, from Electrical Engineering at MS&T, will assemble the equipment that will actually measure the electrical output of our new system, telling us the efficiency of our setup and allowing us to calculate exact costs. Team 4, from Electrical Engineering at Missouri State University, is designing and creating the modular mirrored solar collectors that will heat the oil to power the engine. With this level of expertise working on the project, we shall soon know how well this idea can help the world! We’re currently in the process of trying to raise money for the testing via crowdfunding on Indiegogo.com. Crowdfunding aims to raise a certain amount of money by receiving small donations ($1, $5, $50, whatever the contributor wishes) from as many people as possible. Please check out our campaign page and help us reach our goal! The first is that we’ll need to test a number of different oils to find one that has a reasonable life expectancy as used in our system. This should not be too difficult, but if it does turn out to be an extensive challenge we’ll be consulting with a chemist to explore our options. The second is in regards to insulation of the engine. It will be extremely important to make sure that as much thermal energy is contained within the engine to assure that it runs as efficiently as possible. There are many different ways to accomplish this, we’ll just have to find out which works best! Please be sure to see our FAQ page, we’ve posted all of the common questions people have and given the answers! You can also follow us on Twitter (@hydroice) and like us on Facebook (facebook.com/hydroicesolar). Thanks for your interest and support! I believe You go the right way. The price and single house use are the drive for sucess. The sun is free is less important eficence from 15 to 17% that price down 17 to 15$. While moving away from conventional ICE motors to electrical would be more efficient for transportation – this turns things upside down – (love the concept) i have to state the obvious – have you not considered raising the necessary working capital via Kickstarter.com – post your project there and i’ll be the first to support it with $$. Hi Willy, thank you for your support and comments. Yes, we actually did attempt to post our project on Kickstarter but we were denied because “it fell outside of Kickstarter’s goal and focus.” So instead we turned to Indiegogo.com, a very similar and nearly as popular crowdfunding platform. We would love to have your support, you can visit our campaign page at http://www.indiegogo.com/hydroice. Ah yes, you’d need to deliver a working unit at least! Then approach Kickstarted again – they have the crowds that make this possible! We originally had the same thought, the issue being that we didnt have a full solar system. However when we asked Kickstarter customer service about that issue they continued to state that the issue had to do with not falling under the art, design, and hacker/maker focus. After those discussions with them we found others online who had similar issues and that Kickstarter had been having issues when IP was involved. So if that truly is the issue, they would not approve our project even if we came back with further progress (which of course we’ll continue to work on). Indiegogo has a great crowd too and we’re starting to get some good press coverage, hopefully we can make things happen on there! I do hope that you’ll still consider contributing. Thanks for your support Willy! This is great! I believe that you are in the right direction. We definately need innovation. If we keep doing things the same way we will always get the same results! right? we need people to think differently and innovate. Cant help wondering how efficient the hot oil – steam conversion will be, esp in a cold engine at start up, you must need a lot of oil to carry enough heat to vaporize the water? If you can get the oil that hot, couldnt you use it to transfer its heat onto a ‘hotplate’ inside the cylinder head that the water is then squirted against? It would remove the need for a seperator too.. Love your idea in principle – I live in a wooden cabin and have been waiting for an affordable way to generate my own electricity so hurry up! …I see a few issues, some fixable, some less so. First, while removing the boiler from the whole “steam plant” equation really does help the safety side of things, you have to be VERY VERY SURE that your separator removes ALL the water from your exhaust. Why? Because if you have even a tiny bit of water in your oil tank, and your heat it to 700F, it’s going to boil and expand… and suddenly your low-pressure oil reservoir systems just turned into a really weak boiler full of oil that’s hot enough to burst into flames. Instead of venting superheated invisible steam that can strip flesh from bones in seconds, you’re going to be spurting oil around at temperatures that cause spontaneous combustion when meeting atmospheric oxygen. Not sure if that’s really a step up. Second, while oil and water don’t mix, they do tend to form a really annoying to work with mayonnaise-like suspension of oil globules in water when mixed together really well. This takes a long time – or a lot of energy – to completely split apart. Third, in addition to the previous problems with separating mayonnaise, heat dissipation will be an issue. Internal combustion engines carry a LOT of their waste heat away with exhaust, but in a closed-loop system like the one they’re proposing here you need to remove the 85% of the energy you don’t convert into work. Steamboats traditionally do this with a condenser that sits in the water, but if you’re not near a large body of water, well… let’s just say your condensing apparatus is going to be a huge, complicated, and difficult to work with because even if you don’t have a high-pressure steam BOILER you’re still going to have a high-pressure steam CONDENSER. You could, of course, run the oil at a cooler temperature… but that drastically cuts back on your efficiency, because your power depends on having a lot of pressure inside the cylinder, and that pressure comes from the steam, and the pressure of the steam depends on the temperature… well, you get the idea. Basic thermodynamics. So anyway. It’s a cute idea, but unless they’ve got some really amazing tricks to solve the glaring technical fiddly parts I don’t think it’s going to get very far. I hope I’m wrong… but I don’t think I am. Thanks for your comments! Some of your concerns are right on and like you say, there are ways to solve them. Check out our latest blog post, it addresses your concern about the steam/oil separation. jerry oil at 400 C meeting water equal super heated steam very quickly. Hotplate idea will not work. If you are going hot plate you are forced down the stirlin engine and other heat pump engine design. A normal engine requires the air to cool constant heating will work against that. This system looks promising to me due to the fact the hot oil is storage. Ok maybe not brillent storage. The oil will not magically go dead cold instantly. There are three big question. 2)Next is how pure the water has to be. Seperator may not be a very big problem if 50/50 water/oil mix can be injected to cause the expand. Basically is the engine able to operate on the water that collect in the bottom of the engine oil tray. Because its not just the oil and water you intentionally mix that will be contiminated. The engine operational oil will be contiminated as well. 3) Can the heat oil and the engine operational oil be the same. This would make live simple since then all oil could be going threw the seperator. Yes water contimination happens to normal engine oil as well due to water being produced as part of the burning process. Yes long term running this could be a nasty cause of a miss fire. The Wankel engines use to suffer from pistons burning away. There is no fire in this. So it might be possible to build a Wankel engine that does not burn. Contaiminated water test should be possible on the engine prototype you have now. Like you would not expect 50/50 water oil mix normally being injected. But seperator not quite working right the engine could see like 90 percent water 10 percent oil instead of pure water. The less pure the water has to be the cheaper design seperator you can use. If you are really lucky a basic reservor setup will work. The other side is a preheater not presurised for the oil to steam the remaining water out the oil. Getting pure oil is not hard. Getting pure water that is another problem. If it don’t need pure water makes life many time simpler. The wankel engine is a curious possibility, I imagine it wouldn’t be that tough of an undertaking at all. And yes, it is our every intention for the heat and engine oil to be one and the same. It makes that aspect of the system nice and easy! Fantastic idea using the heat exchange oil. Do you need the compression cycle? Looks to me that you have a wasted cycle moving the piston back up. Have you considered the Wankel rotary engine cycle? Using side porting (as in Mazda Renesis design but exhaust ports either side with no intake ports) you could run oil / water injectors on each side of the engine. With a single rotor design you would have a power stroke for every half rotation and no wasted stroke. Thank you, Stephen! For the most part the compression cycle isn’t utilized. However we will be testing out different timing for injection of the oil during the up-stroke so we’ll see how that all works out. The wankel is a very distinct possibility, at first glance there’s no reason our approach couldn’t be applied to that engine as well. Using waste heat sources rather than going the solar route might enable the invention to get to market quicker as the team can just focus on the engine rather than having to integrate a bunch of other technology to get the solar heat. We couldn’t agree more! For many of the first tests we will use various heat sources so that we don’t have too many details to try and work out at once. We have a specific team at MSU just working on the solar collectors so that the others can focus solely on the engine. This indeed seems to be a wise thing to do. Especially since a price of $ 7/Watt for PV is rather unfair. Actual PV prices in fact are much closer to the $1.7/Watt you aim for. The technology in itself is beautiful and innovative. Using the concept to benefit from waste heat or maybe geothermal sources however makes much more sense. Would a scroll expander work with your system vs. the reciprocating engine conversion? If so, what do you think the pros or cons would be for both alternatives? Hi I have a similar idea. Take the use of the parabolic reflector and focus the suns energy on a Thermoelectric Generator (Google that phrase) Im not sure if the results would be the same in terms of output but the process would be really simple. Good idea by the way and good luck with it. I for one would be interested to market the product here in New Zealand if you get so far as you would need some support. Hi, Thanks for your remarks. My system: heat pump with feedback” doesn’t need big surfaces. The sun-heated air is the source for all of 24 hours a day. It makes it cheap, effective and clean. 345 m3/hour ambient air is enough for 11 kW – as we precalculated it by a simulator program. We have a budget for developing it from 1st of January 2013. I hope we have prototipe in half a year. Thank ou for sharing, and good luck with your project. Please excuse my ignorance. I would like some clarification about the information and schematic contained in the site you referenced. To begin with, is the system substituting air for standard refridgerents? Does a single shaft drive the two compressors and two expanders jointly? If so, how much force is required to drive each of the compressors, and how much force is produced by each expanders? Another interesting contribution for making use of solar energy. However, what is the advantage of hydroice compared to using solar thermal energy in “conventional” applications such as the Sterling engine or a steam turbine? These technologies are well established and AFAIK their efficency is better -Thank you! Thanks Michael! While Stirling engines and steam turbines are well established, cost and saftey have prevented them from becoming widely implemented. There’s a bit more about this on our FAQ page. Hope that helps! one thought about the unutilised compression phase in a piston engine: I guess it would be possible to compress air or the steam mixture remains – at least by using part of the cycle. Compressed media can be stored (buffered), drive something and also cool something very efficiently – actually much better then with electric energy. Why do you need to inject the hot oil? What would happen if you just heated the piston and the cylinder, and then injected cold water, which would flash to steam?